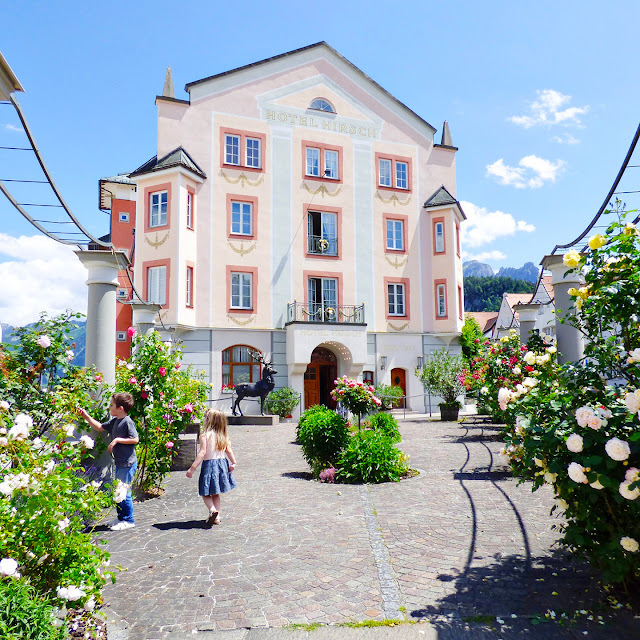 Füssen has a rich history and some very charming sights, including the lovely and restored PINK Hotel Hirsch. The hotel opened in 1904 and has cool art nouveau styling. My future home. Just sayin'. On Kaiser Maximilian Platz is the entertaining "Seven Stones" fountain, built in 1995 to celebrate Füssen's 700th birthday. The stones symbolize community, groups of people gathering and coming together. The coolest part? They spin! The spinning stones aren't connected and spin with waterpower. We let the kids splash around a bit, then walked along the medieval town wall. 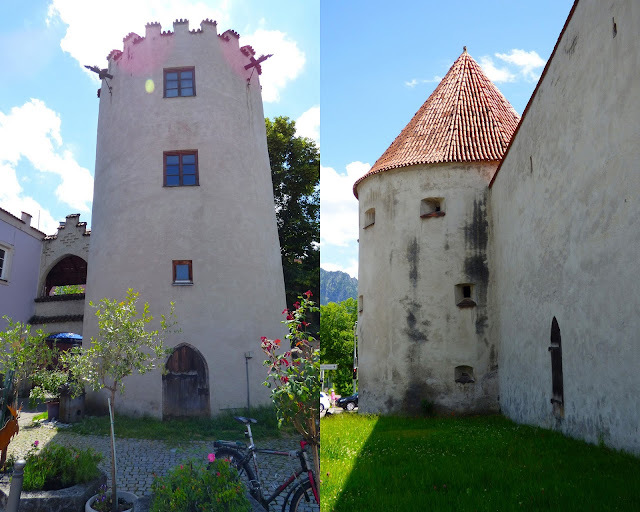 The historic cemetery of St. Sebastian is a peaceful oasis of Füssen history. It was established in the 16th century and fills a corner between the town wall and a Franciscan monastery. From up near the monastery is a great view of Füssen. The Church of St. Magnus is the spire on the left with the High Castle on the right. Germany's famous Romantic Road ends right here in Füssen. The Lech River rolls by town. In its heyday, the Lech River was an expressway to Augsburg 70 miles to the north and was used heavily to transport goods. The back of a former Benedictine Monastery. Up hill from the river a little bit is the Church of the Holy Spirit. This was the church of the rafters who transported goods on the river so their patron, St. Christopher, is featured prominently on the façade. Fox and Jane being Fox and Jane. We continued up to the front of the Benedictine Monastery that was secularized in 1802. Today, it houses the city hall and a museum. Courtyard of the old monastery. On the square is a fountain honoring the famous 16th century lute making family, the Tieffenbruckers. In its day, Füssen was a huge center of violin and lute making with about 200 workshops. Today, two such workshops still survive. Around the corner from the old monastery is the St. Magnus Basilica, dedicated to the saint who in the eighth century worked miracles all over this area. The Evans Family in Füssen, Germany on Tuesday June 28th 2016. I'll never get tired of these ornate wrought iron signs. Reichstrasse is the main shopping drag connecting the castle to Kaiser Maximillian Platz. We strolled along enjoying the wonderful sunshine and stopping to let Nick try some German treats like pretzels (Brezels) and ice cream (Eis). What a beautiful little town! LOVING the colors of the homes!!!!!!!! How can one think about leaving this magical country? Beautiful day, beautiful photos and beautiful kids.....thank you for posting these photos.